Gabriela Hearst - This ivory Bridget dress is made from velvet herringbone; an apt representation of Gabriela Hearst's instinct for after-dark elegance. Exclusive to MATCHESFASHION.COM, i t's crafted in Italy with a generous V-neck - mirrored by a scoop back - with skinny shoulder straps, then lined with coordinating silk to ensure a fluid drape. Offset the slender silhouette with slingback stiletto and a compact box bag for an evening occasion. 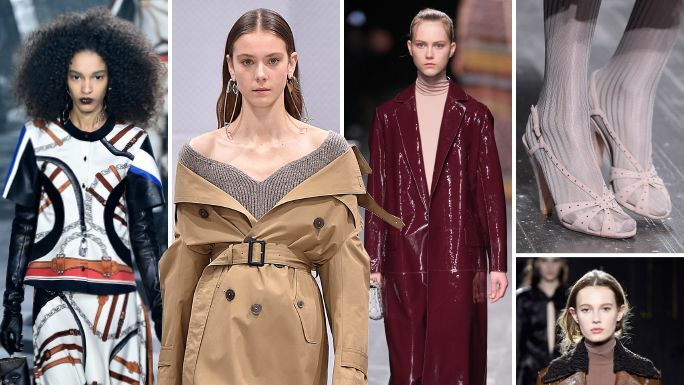 From cats to colorful velvet, scroll through to see the biggest trends and styling tricks from the fall 2016 shows at Paris Fashion Week. Navy blue wool blend flared dress from Gabriela Hearst featuring a round neck, a long length, half sleeves and a flared style. Multicolour wool striped dress from Gabriela Hearst featuring a v-neck, long sleeves, a loose fit and a long length.